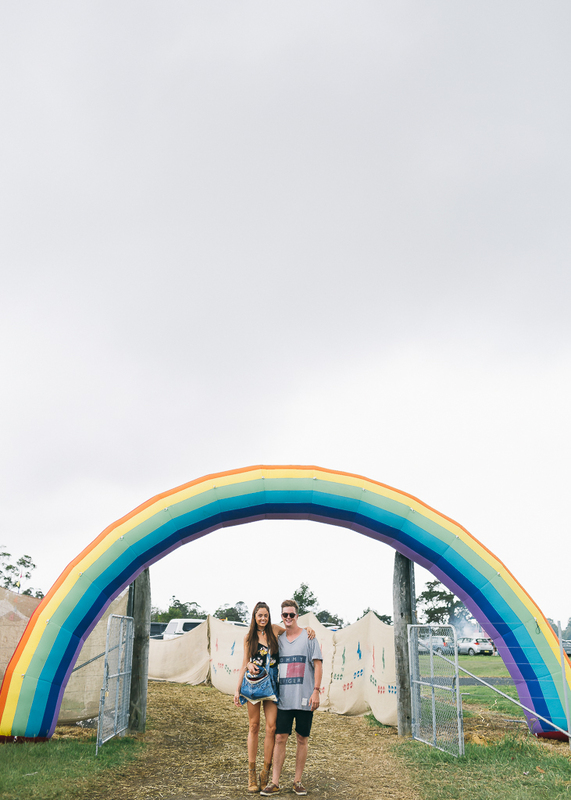 Showcasing the Central Coast region as a tourist destination, the Mountain Sounds Festival is a contemporary boutique and sustainable event combining Australian music, art and culture. The Mountain Sounds Festival uses the diverse Australian landscape and way of life as inspiration for it’s unique range of music genres and aesthetics. This year we were welcomed into the festival grounds through a gigantic blow up rainbow and shortly after getting our wristbands we walked straight into a sea of boho festival goers who were lining up to take their turn skipping on a gigantic makeshift rope made from bound scarves, we passed by a pyramid made from bales of hay as we wandered through ‘couchland’ where groups of people chilled on an array of different armchairs and lounges, we spied VIP’s sipping drinks and chatting inside of the spacious Tipi’s, and we crushed on the serious festival fashions donning the guys and gals. A huge tropical blow up pineapple marked the food vendors area and the festival food was made fabulous with The Hungry Traveller Kombi parked and serving gourmet burgers, along with other delicious local food vendors. Headlining acts for 2015 included Alison Wonderland, DZ Deathrays, Touch Sensitive, Deep Sea Arcade and local up and rising Central Coast band, Tropical Zombie, plus heaps more. The festival offered it’s ticket holders the option of purchasing camping tickets, where they could BYO or rent-a-tent and all campers were treated to parties plus access to a silent disco in the camping grounds. Mountain Sounds Festival is an 18+ event, on site parking is available and a shuttle bus service was provided from Gosford Train Station on the day of the event.